When the hands at the Darwin Ranch head into town from Deception Pass, don't play cards with them; they have a reputation for dealing from the bottom of the deck. Although common-ancestor evolution is supposed to be upward and increasing in complexity, these owlhoots have the notion that a loss of function or information is evidence for evolution! They use a similar bad argument about the genetic code. Office of Biological and Environmental Research of the U.S. Department of Energy Office of Science. science.energy.gov/ber/ Image source here. Use on this site does not imply endorsement. Your computer uses a binary code to do all its amazing (and sometimes annoying) functions. The genetic code is quarternary, which is far more complex. From that, a passel of things develop with various RNA molecules, proteins, enzymes, and the like. Evolutionists claim that the specified complexity of the DNA language is not complex enough, so there's no need for the Creator. These same educated people should know that any code or language requires a mind behind it, and the mind of God is far beyond ours. In addition, there is a great deal that remains unknown in this area, but evolutionists lack humility and make pronouncements anyway. When I was taking my first General Chemistry class as an undergraduate at The Ohio State University, I never realized that my professor was the codiscoverer of the 21st amino acid. Amino acids are the individual building blocks that make up proteins. Each amino acid is important in making the right protein because one amino acid change can lead to diseases like sickle-cell anemia. While there are myriad amino acids, the standard genetic code found in living things only incorporates 20 of those amino acids. Discovery of the 21st amino acid (called selenocysteine) was significant because of the possibility to elucidate new protein combinations. Since discovery of the 21st amino acid (along with the 22nd amino acid pyrrolysine), we now know not all organisms incorporate these extra amino acids and some only rarely do so. The genetic code is very important because it turns the information in our DNA into proteins that do all the work in every single cell. If the genetic code is altered significantly, then life cannot exist. What Is the Genetic Code? Evolutionists frequently cite the genetic code’s universality as proof of evolution from a common ancestor. 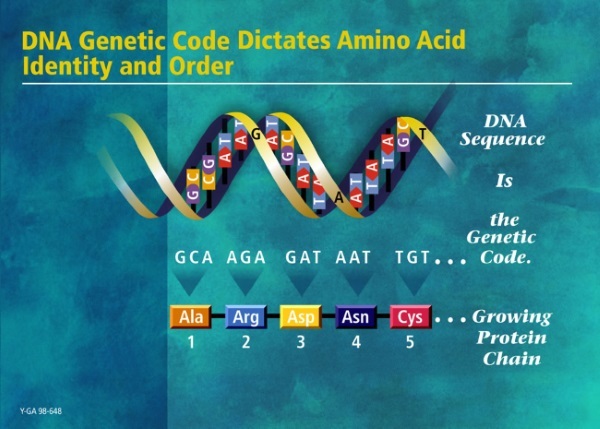 The genetic code is the series of nucleotides that encode for a particular amino acid. Nucleotides are the Adenine, Cytosine, Guanosine, and Thymine (ACGT) present in your DNA. During a process called transcription, the information from DNA is synthesized into RNA. When transcription occurs, all Thymines in DNA are replaced with Uracils in RNA. It is difficult to say exactly how many different kinds of RNA molecules exist,1 but the three forms of RNA important for the production of proteins from genes are messenger RNA (mRNA), ribosomal RNA (rRNA), and transfer RNA (tRNA). To read the rest, click on "Is a Limited Genetic Code Proof That God Is Not Required?" It's your deal.